Phil holds a BS in Management from Bentley University and a studied Leadership at the University of Southern Maine. Certifications and practice using in assessment tools such as 360-degree feedback, MBTI, Kolbe Index, Gallop Strength Finder help Phil to establish a baseline for his clients. Phil has also been mentored by coaching and training industry leader Doug Carter since 2006. Phil's career as a strategic business consultant and financial planner combines with his ability to connect with people to help them achieve new levels of success. Helping others believe in their unique strengths is his passion and mission in life. Discovering Significance: A Self-Reflection and Journaling Process about how our Experiences and Relationships affect our Success and Impact by Philip Giordano is a self-help book for those seeking to reach their highest potential while also staying authentic to themselves. Giordano provides tools for journaling and reflection through his anecdotal writing all the way to a section at the end of each chapter, called Phil's Coaching Corner, that somewhat summarizes what has been presented in the previous chapter before giving the reader questions to answer and inspirational quotes. What I found in Giordano's well-written book was relatable. I found myself doing what Discovering Significance was asking readers who would be actively seeking this sort of guidance would do; I was reflecting. When I wasn't reflecting, I was engrossed in his often entertaining tales, his stories and insights were thoughtful and quite wholesome. Overall, I think people who lack (or have low) self-confidence or are otherwise introverted would appreciate Giordano's wisdom. One of the most powerful chapters in Discovering Significance, for me, was Regrets. "Regrets that stand long enough can create beliefs that limit our actions and put perceptions in place that may not be true." It went deep into the turmoil we feel when we look back at our "what-ifs" and how regrets limit us and our outlook. At its core, Discovering Significance is about living life with purpose and realizing your significance. I urge those having trouble seeking out their great side to pick up a copy of Giordano's book; they will not regret it. In Discovering Significance, executive coach Philip Giordano provides an innovative blueprint for anyone seeking to move beyond what we normally think of as the fundamental goal of business leadership—a drive for success—to the deeper and generally more elusive quality he calls significance. In the book, he draws together the seemingly opposite qualities he terms love and power to provide a way of achieving a meaningful impact—significance—that goes beyond mere success in both business and other aspects of life. He does this through an honest and engaging look at key moments in his own life, as well as by involving the reader in a similar process through journaling exercises meant to give them a better understanding of their own stories and how those stories impact their significance. One of Giordano’s major achievements in Discovering Significance is his ability to avoid the abstract jargon and stylish buzzwords that are a feature of so many business and self-help books and keep the discussion always in captivatingly human terms. His book, and his coaching career, may be aimed primarily at executives in leadership positions but the topics he explores (and asks his readers to delve into in the journaling exercises) don’t much fit the normal mode of business books. Instead, Giordano offers chapters on such things as wisdom, humor and healing, friendship, regrets, and love. That unique angle, told largely through his own fascinating life story, makes for not only a significant self-help book, but also an interesting and enjoyable read. In the prologue of Discovering Significance, Philip Giordano defines several concepts that became the basis for this thought-provoking work. He rightly points out that most leaders focus on either success (a measurement of achievement), or significance (a measure of impact). The best leaders have combined the two, and the process of how to reach one’s full potential as a leader is explored in a comprehensive, understandable manner. Philip Giordano presents a wonderful exploration of this leadership model in Discovering Significance: A Self-Reflection and Journaling Process about how our Experiences and Relationships affect our Success and Impact. The book is organized into three main parts: The Foundation, The Frame, and The Details. The epilogue, A Call to Action, is a directive to the reader on how to tell his/her own story to help others - a perfect ending. Philip Giordano highlights the value in processing life and relationship experiences as a method in understanding and improving the leadership role. These insights can become guideposts in the work lives of readers. The author’s style of writing is clear and concise. Each section builds upon the previous one in a smooth, flowing manner. There is a good balance of storytelling and concepts in each chapter. The journaling questions at the end of the chapters are ideal for introspective pondering. Discovering Significance by Philip Giordano is full of pragmatic wisdom. It presents a refreshing and fascinating way to discover one’s hidden potential. 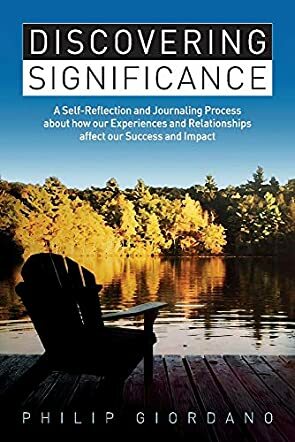 Discovering Significance: A Self-Reflection and Journaling Process about how our Experiences and Relationships affect our Success and Impact by Philip Giordano is an empowering book that gives readers the tools they need to lead themselves and impact others. Written in a unique style, the book takes readers through the stories of the author's life and shows them how he made the shift, transitioning from self-doubt to positive action, and transforming his life through the examination of his core beliefs. What does it take to dream and achieve purpose? How do our stories affect our personal growth and ability to create dreams, communicate them, and achieve them? Such are the kinds of questions that are brilliantly answered in this book. This book will give readers insight and wisdom on tapping into their core potential and becoming better persons. The author shows, with relevant examples, how our stories are at the base of our core values and proposes a path to changing limiting beliefs and replacing them with positive ones. The writing is simple, the stories both inspiring and entertaining, and each chapter is followed by insightful thoughts and exercises that will help create awareness of positive values and identify the path to follow. This book is thought-provoking, hugely accessible, and grounded in psychological thoughts that will surely make a great difference in the reader’s life. Discovering Significance will change the way you hear your story and the way you look at yourself; one of those books that help readers shape a vision and reach their peak potential. Ever wondered how true success feels and how to achieve it? If so, then you have picked up the right book. We strive to achieve success but often forget that even when we do so, we might not achieve complete fulfillment. Success on its own is not enough unless it comes with realization and execution of purpose. In his book titled Discovering Significance: A Self-Reflection and Journaling Process about how our Experiences and Relationships affect our Success and Impact, Philip Giordano offers advice to guide you on a self-reflection path so you can start on a journey that will bring you results while leaving a positive and lasting impact on the world. Discovering Significance by Philip Giordano is an informative, relatable and well-written book filled with guidance and exercises to help you internalize the message and reflect on your own journey. Discovering Significance is a three-part journey with each part taking you closer to realizing your full potential and true purpose. The book clearly demonstrates that success and significance are two different things, but they are not mutually exclusive. Everything comes together beautifully when the two aspects are combined to achieve results and have an impact. For all those still struggling to achieve their goals, I hope this book helps you overcome your limitations so you too can unlock your full potential and purpose. Through his own life experiences, Philip Giordano will teach you a lot about yourself, your beliefs and your relationships. He will show you how all this affects your journey and you will have a lot of laughter along the way. Discovering Significance: A Self-Reflection and Journaling Process about How our Experiences and Relationships Affect our Success and Impact by Philip Giordano is designed to help readers unlock their leadership potential and take the lead in their lives, but it is unlike most books readers will find on this subject. Instead of dishing out pieces of advice and telling readers what to do, the author helps them see the importance and the place our stories play in our growth process and how the way we read our personal story can determine our levels of success in life and business. In this book, you will learn about the key moments in your story and discover the secret of using those moments to unlock hidden gems in your life. The author includes personal stories and demonstrates with clarity and insight how these shaped his life. This book is filled with insight and wisdom, a book with stories and lessons that reflect the reality of most of us. The writing is simple and clear and the tone strong and compassionate. While I found the stories interesting, it was the author’s message and how he allowed his personal life to speak to him that moved me. He articulates with unusual brilliance on how our limiting thought patterns are created and offers wonderful advice on how to beat them. His personal journey from self-doubt to confidence and taking control of his life makes his words more convincing and meaningful. Discovering Significance: A Self-Reflection and Journaling Process about How our Experiences and Relationships Affect our Success and Impact will transform you from a broken person to one ready to create your destiny and influence others. Richly conceived and skillfully written.